If you want to avoid continued sickness, problems with the mouth, sore throats, skin rashes, etc, bankruptcy, legal problems, gossip, relationship problems, loss of wealth, legal problems, car accidents, accidents involving metal and just an overall feeling of bad luck in 2003, read on..
Are you prepared for 2003? On February 1st 2003 we enter into a new Chinese year (year 4700 in the Chinese calendar), the year of the Yin water Goat/Ram/Sheep. 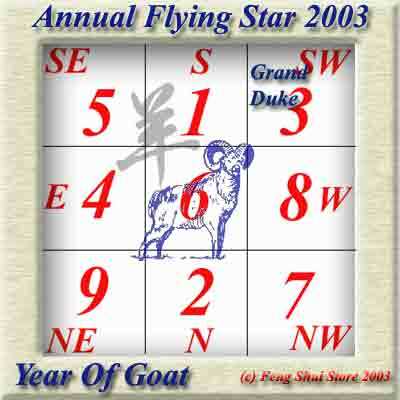 The Xuan Kong annual flying stars full analyse is detailed below. Overall the year should be better than 2002, the worst months will be April and October and August for the stock market. The Grand duke Jupiter is located in the south-west this year so you should avoid any building work or tree lopping at all costs. You should not work with you back facing direct west as this in conflict with Grand Duke. The year conflicts for people born in the year of the Goat, Ox or Dog, 2003 will be a clash year and they should have a Horse ornament or pendant close to them, It will be a good year for Horse, Pig and Rabbit. So what does all this flying star stuff mean? Flying star (Xuan Kong) Feng Shui is the most powerful form that most professional Practitioners use, it has absolutely nothing to do with astrology or the stars in space. 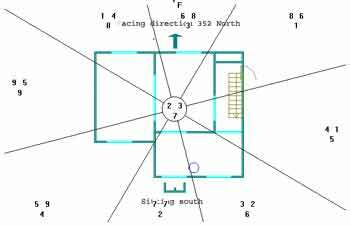 It is an analysis of the five elements and star combinations that occupy your building. Each Chinese New Year these annual stars change, bringing good and bad energy. Normally in this newsletter I concentrate on the bad stars and how to dissolve their power. However, this year I have detailed all the good stars as well so you can take advantage of their presence. Every building throughout the world will have these changing annual stars and you will need to take into account their ability to cause harm ranging from, sickness, legal problems, gossip, relationship problems and just overall bad luck and of course how you can take advantage of the good ones. The 5 yellow this year is located in the south-east of your home this year, this is an annual visiting star and changes every Chinese New Year. The 5 yellow is the worst star, it causes sickness, problems with the mouth, sore throats etc, bankruptcy, legal problems, car accidents, accidents involving metal and just an overall feeling of bad luck. This one is really bad, as the year goes on it gets stronger. The 2 black is residing in the north of your home this year, this is the second worst star and will cause sickness, stomach problems, extreme bad luck, legal problems arguments and if it is in your bedroom or main doors as the year goes on you will generally feel run down, waking up in the mornings feeling like you need another nights sleep or again it can manifest in the way of legal problems, loss of wealth, bankruptcy or just overall bad luck. Unfortunately every home and office in the world has these two bad stars in the south-east and north of the property. The best way to locate them is by finding the centre of your property and then using a compass find south-east and north and then follow the instructions below. Three Killings (San Sha) falls into the west but because we have the very powerful auspicious star 8 here, it almost dissolves its evil power. The best way to weaken it further is face the west when working (do not have back facing west as this is an insult to him) and also place a Three legged wealth Toad God here to appease him. This is also very good for the 8 wealth star, do not use a metal one (or metal colors gold/silver/copper) though as metal will weaken the good earth, the best type to use is the red Shou Shan stone ones as the fire colour of red feeds it. If your best direction is west when sleeping, it is still Ok to sleep with the crown of your head pointing west. Star 1 White is located in the south; this is a fortunate star and can be enhanced with metal. If you followed our advice last year you would have placed lots of metal into this area to weaken the bad 2, good news, you can leave the metal here as this now has a good 1 water star which is fed with metal (metal creates water, imagine a piece of cold metal, cool air (Chi) touches it and forms condensation and water droplets form, thus creating water). Good colours to use would be white, gold, silver or copper. You should avoid earth elements such as crystals, porcelain, terracotta or earth colours yellow or brown, because earth weakens water. If you have bathroom here make sure you keep the toilet lid closed when flushing. This is a good area to have a brass three legged Toad as the metal along with the symbolic powers will increase the wealth power. Also a good area to have 3 Chinese coins tied with red ribbon. Star 2 Black is located in the north; this is an evil star causing illness, bad luck and all things bad and can be weakened with metal. If you have a bathroom, cloakroom, en-suite, kitchen or a large cupboard in the north this is good for you this year. You should place six Chinese I-Ching coins tied together with red ribbon in this area to weaken the bad earth (imagine a metal spade digging away at the earth, it will never control but constantly weaken it) last year I received many e-mails saying that they had been told that it should be 5 coins, sorry if you have been told this they are wrong, the reason you use 6 is because 6 is the Trigram Chi’en which is a metal element, the reason other sites got it wrong is because they referred to wind chimes and some Practitioners say 5 rods, actually it is 5 only if you have another in the middle making 6. Good colours to use would be white, gold, silver or copper (metal colours). Avoid using fire or fire colours such as red, pink or purple as this will strengthen the inauspicious effects of the 2. A good cure as well is a Wu Lou (Gourd or Calabash) or a gold coloured ingot this is a powerful cure for the 2 & 5, you can find them on metalcures to give you an idea of what they look like. Star 3 Green located in south-west is evil and causes legal problems, arguments family breakdown and can be weakened using fire or fire colours such as red. Last year we recommended placing a water feature here, please make sure you move it as this will feed the inauspicious effects of the 3 wood (water makes wood grow). You will need fire in this area to weaken it. Place a lamp here or if you have a fixed light already leave it on as much as you can, if it has a red bulb even better, be careful f you using a red bulb as this could send the wrong message. This year I need fire in my main door area (north-east), of the top of my head I thought would change the bulb to a red one outside my main door, now in the UK and I know in Amsterdam a red bulb outside your home means you are a brothel/prostitute, now this just goes to show that thinking of the top of your head has drawbacks (think twice). Good colours to use here would be red, pink or purple (fire colours) try and avoid blues or black. Don’t worry if you have these colours already you do not need to change them just use the element itself. I would estimate that I have 25% of the wrong colours in my home in any given year because the annual star changes every year and for this I would need to be changing my colours yearly, I am sure Michael would not be too happy about this. I am only recommending colours as an option if you were thinking of changing colours. A simple and cheap way is also to use floor mats, going back to my front door I intend to place a red doormat here (obviously not a red bulb), as this will have fire elements. Another good cure is a laughing Buddha. Star 4 Dark green located in east is a relationship star, for relationships or to find new love you can place a water feature here to feed the good wood, however if you have no problems with relationships do not use one as they can cause you or your partner to stray or become involved in a sexual scandal. If you would like to attract a new partner a water feature is good. Also a very good place to put a pair of mandarin ducks or Dragon headed Tortoise regardless of your relationship as this will enhance, strengthen or attract new love. Star 5 Yellow located in the south-east, the worst star can be weakened with a six metal wind chime or metal ornaments as listed on this page cures2003. Yuk, I hate this star it causes all sorts of bad problems. For me I am glad as this star now falls into our main family bathroom a perfect place, this is the one time you can leave the lid of your toilet open when you flush as this will flush the badness away. You should place a 6 metal wind chime here or a salt water cure to weaken it. If you have a bathroom, cloakroom, en-suite, kitchen or a large cupboard in the south-east this is good for you this year. Avoid using fire or fire colours such as red, pink or purple as this will feed it. A good cure as well is a Wu Lou (Gourd or Calabash) or a gold coloured ingot this is a powerful cure for the 2 & 5, you can find them on cures2003 to give you an idea of what they look like. Star 6 White located in the centre palace, medium fortunate. This is a nice number to have in the centre and best left alone as it like peace and quite and all things beautiful. Star 7 Red located in north-west, normally unfortunate although until next year January 2004 can be used for good energy. This star is only good for another year so “make hay while the sun shines” place crystals, porcelain, terracotta or any earth objects here to enhance further. Also a good place to hang faceted hanging crystal spheres. Normally when you have 7 water stars (up until Feb 2004) you would place a water feature here to enhance wealth luck, however you should not use water on a 7 annual star. The reason is water rusts metal. If you have a toilet, kitchen here make sure you close the lid when flushing this year. Star 8 White located in west, very fortunate and can be enhanced with fire or colours red etc. The best, this one has given me a double 8 in my lounge, yippee. Place fire objects or colours here to enhance (fire creates earth). Avoid at all costs the use of metals or colours white, silver, gold or copper as the metal will weaken the good earth, again don’t worry if this area is already painted white just make sure you have plenty of fire or fire colours here and leave lights on as long as you can. A good place to put a three-egged Toad, although do not use a metal one as this will weaken the good earth. You can also assist this area by hanging a crystal faceted hanging sphere to distribute the good energy. Star 9 Purple located in north-east, fortunate and can be enhanced with wood this is a very good star and increasing in power as we get nearer to 2004 which is the beginning of a new 20 year period. You can enhance this area with wood colours such as greens, a good place to have plants (avoid bamboo) unfortunately wood is only good if it is growing, the power of having a wooden floor or a piece of wood furniture is very limited. Please remember that this is the annual stars and I cannot take into account the fixed 3 other stars (mountain, water & period) and the relationship they have, so if you have been advised by Michael or some other qualified authentic Practitioner take their advice as they will know better having analysed your flying stars. If you have not had a Xuan Kong consultation using the above information is a very powerful way of enhancing and weakening your annual stars. If your budget does not allow you to spend money on these cures, you can always use metal or whatever element is needed as a cure in itself, i.e. if I recommend a metal Dragon in the south-east, substitute it with a metal ornament or even a metal clock you may have already. If you already have a 7 metal wind chime cut one of the rods off to make it six (make sure it is not all metal though), move a piece of crystal you already own to another part of the home, using the symbolic animal or item of the recommended cure is always going to be more powerful i.e. Dragon in south-east etc. but you don’t need to spend a fortune and it is better to have the element than nothing at all. Reusing last year’s 2002 cures kit. If you purchased your cures kit from us last year or made one up yourself you should follow the advice below. Some sites will tell you to throw away your old 6 coins and wind chimes; although there is some truth in it I see no reason why you cannot reuse them each year. To replenish your items you should either lay them on a clean tea towel and place in the sun or moonlight for around 12 hours, you should also sprinkle some normal table salt over them; this will renew their power and cleanse them of negative energy. I must admit I do throw mine away only because I have the luxury of having thousands of these items to hand. We received hundreds if not thousands of e-mails last year saying how the salt water cure changed the energy in their home for the better; this is a very powerful and little known cure and one that we have been using for many years. You should use the salt water cure this year (Feb 1 onwards) in the south-east and north (DO NOT USE LAST YEARS SALT WATER CURES IF IT IS MORE THAN TWO MONTHS OLD), if you have a bathroom, cloakroom or kitchen here you may not need one as long as you always keep these doors closed. There are many exceptions to be made, the thing to remember with flying stars is if you have a 5 yellow in the south-east the effect of this if it is, in a fairly open plan home is that 5 yellow’s power can drift into any other part of the home, think of perfume, if you sprayed some in your bedroom your partner may still be able to smell it downstairs because the smell goes into the air (Ch’i) and drifts around the home, so as general advice it is better to cure than leave to chance. How to set up a salt water cure? 2: Fill up a glass jar; a jam jar will do with table or rock salt about three quarters to the top. 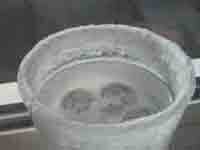 3: Place six coins on the top of the salt. Make sure the coins are Yang side up; this is the side with the four Chinese characters. 4: Fill to the top with tap water. It would be a good idea to place a mat under the jar to protect furniture or flooring. 5: Place the coins and jar in the south-east and north or if you have a full flying star consultation anywhere else that you have the 2 & 5. 6: The jar will form crystals over time; this shows that is working to absorb the negative energy. 7: Mare sure the water is always topped up. You should change your salt water cure every year if it is over two months old, why? Because they store an enormous amount of negative energy and moving it causes problems in all parts of a building. The best way is to get a Tupperware type container (margarine tub etc) and place the entire contents salt, water, glass and coins into it, close and seal the lid and throw straight into an outside bin. If you do not have a container pour the water down an outside drain (one at the back of house that leads away from the building) and place the salt/glass and coins into a plastic bag and place in bin. Please do not try and recycle, it is not worth it, this is the main reason we sell ours so cheap to make sure people can easily and cheaply renew them, last year I saw a few websites selling these for 4 times as much as us. As with all our products they are cleansed of all negative energy and empowered with positive energy and the coins also come from a good dynasty. 1: I covered my jam jar with a lid, as I did not want the negative energy to go anywhere. Good theory but it has to remain open to catch the negative energy in the first place. 2: I clean my crystals that form on the top of glass every week: Oops, once you set it up you shouldn’t touch it again until the following year, why? Because they accumulate so much negative energy and every time you try and clean it you are stirring it up, a bit like poking a stick in a Bees nest. Depending on how much bad energy you have here it may be that the crystals form on the walls or the surface it is placed on, if this is the case clean the area with great care and be careful of what you place it on, I always place mine on a coaster. 3: How often should I have to top up with water? The more negative energy you have the more water is used and of course in the UK this time of year we have our central heating on nearly all the time so it will vary throughout the year, just make sure the water level is kept about 1 inch (25mm) from the top of glass/jar. Six coins in a row tied with red ribbon. Hang this in the north and south-east. Metal Dragon Headed Tortoise in the north-east, facing south-west. Six metal wind chimes in the south-east and also 6 Chinese coins, this is a general cure for the 5 yellow that we should all do. Three Chinese coins tied with red ribbon, in your purse/wallet and all over the house. Metal coins in the north-west or south is good, as well as metal figurines. Do not activate the south-west of your home or office, especially with water, although you can add a little red colour to control the 3 wood. Do not have your water feature in the south-west this year. We have the annual 3 wood energy residing there from the 1st, which is not good, You will dampen the effects by placing something red in the south-west as the fire will weaken the wood, do not use too much though. When using water It is always best to use the actual element itself, so if you need the water element rather than using blue or black colour, use the element itself in the form of an indoor fountain or outdoor pond. You must make sure the water is clean and flowing and never allow it to become stagnant. Water is a powerful cure and is the essence of Feng Shui (Shui meaning water) the Ch’i is caught by the water and cleansed (providing the water is clean) and distributed throughout your property. A good location this year will be east for all ponds, fountains, do bear in mind my comments above on the east sector though. If you would like more details on the five elements please click here.